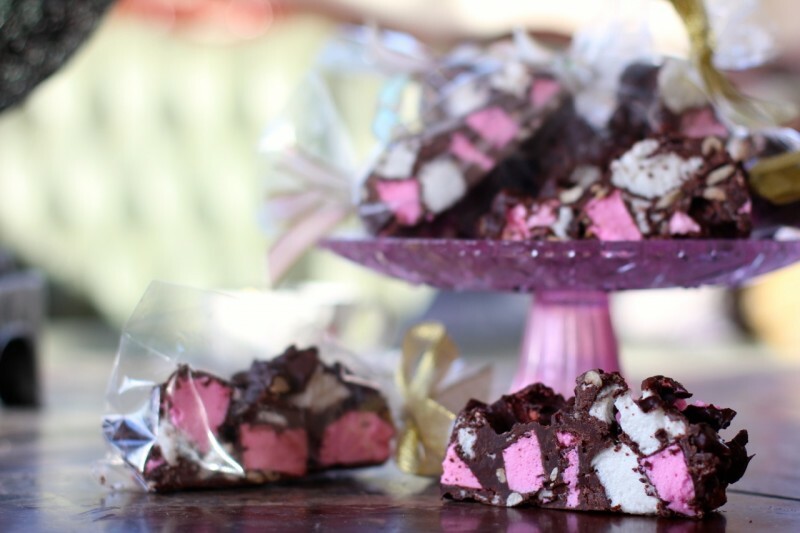 So, I LOVE rocky road, and I used to make it for Christmas gifts and wrap it in pretty cellophane bags with a bow, and people always enjoyed a home made gift- as although small, it meant alot to them that I had taken the time to make it for them! Now that I developed a marshmallow recipe that actually works, I can actually make it once again! 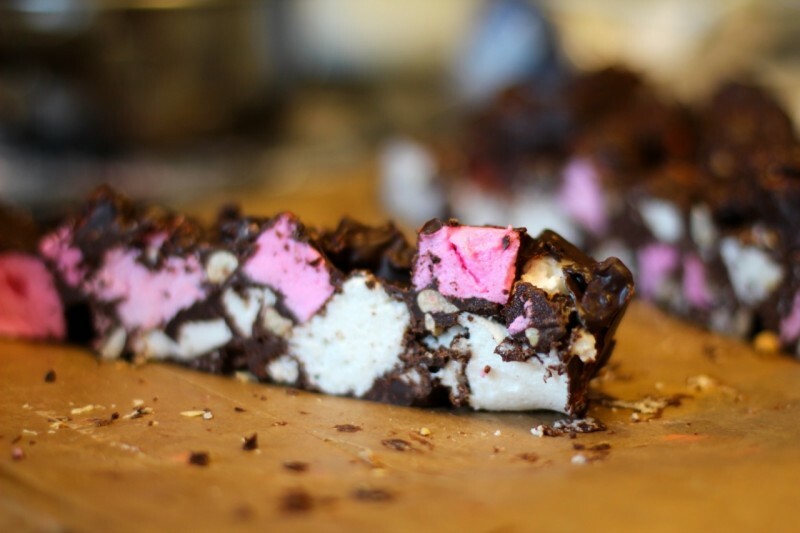 Its so easy to put together once you have made your marshmallow up- you just cut it in pieces, chuck it in a bowl with melted chocolate and peanuts and mix, and voila! 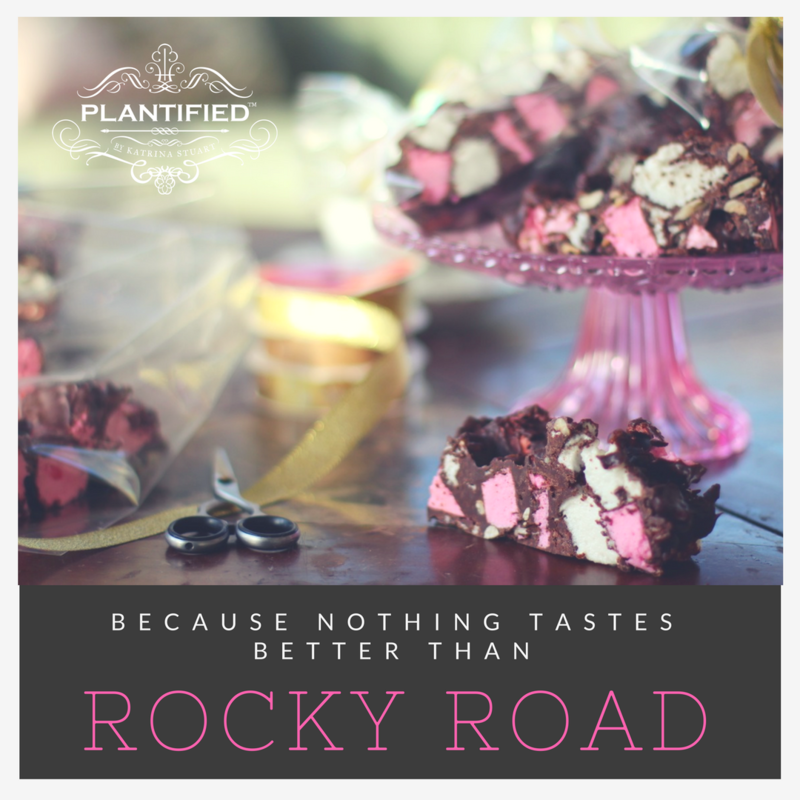 Genuine Rocky road without any animal products! Try it- you’ll LOVE IT!!! Add 175 grams (3/4 cup) Aquafaba (butterbean or chickpea liquid from can) plus 2 grams (1/2 tsp) Xanthum gum to a stand mixer bowl and begin beating. (you can use electric hand mixers too!) 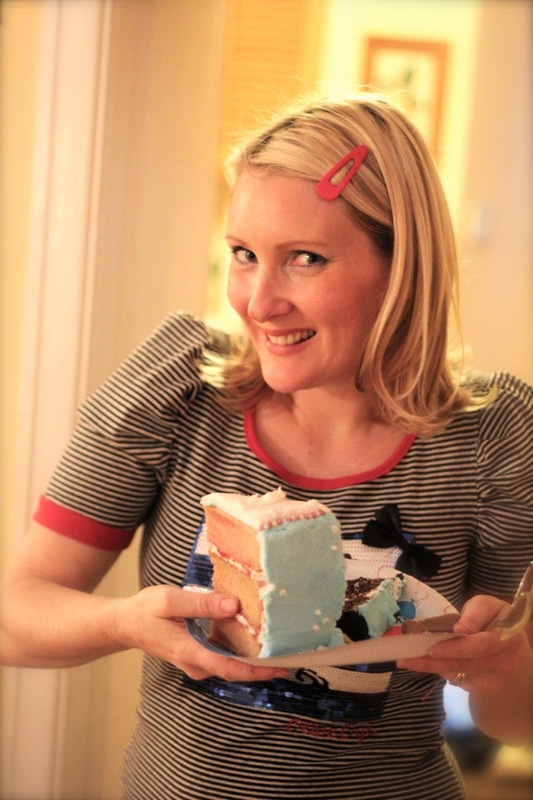 From experience, I know that although it forms stiff peaks quickly, the volume increases and becomes fluffier If you start beating it at the BEFORE you start the sugar syrup, so get it going before you do anything else! Now,lets start the sugar syrup: Add 405 grams (1 1/2 cups) of sugar and 10.9 grams (2 1/2 tsp) of Agar powder to a saucepan and stir to combine thoroughly. Continue stirring from time to time until the temp reaches 250f on a candy thermometer. Once the aquafaba has formed stiff peaks and the sugar syrup is ready, slowly add the sugar syrup in a thin stream as the mixer beats it in until all is combined. Add in 2 tsp of vanilla extract and continue to beat. Take out half the batch and spread into half the tray.add strawberry flavouring and colour to the remaining mix quickly, before it sets and mix in then spread into the other half of the tray and leave to set. 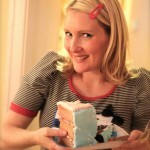 Once the marshmallow has set, cut it into approx one inch squares. Melt 600 grams of chocolate.I like to use a saucepan with hot water simmering, with a bowl sitting on top, so the chocolate melts, but does not burn! 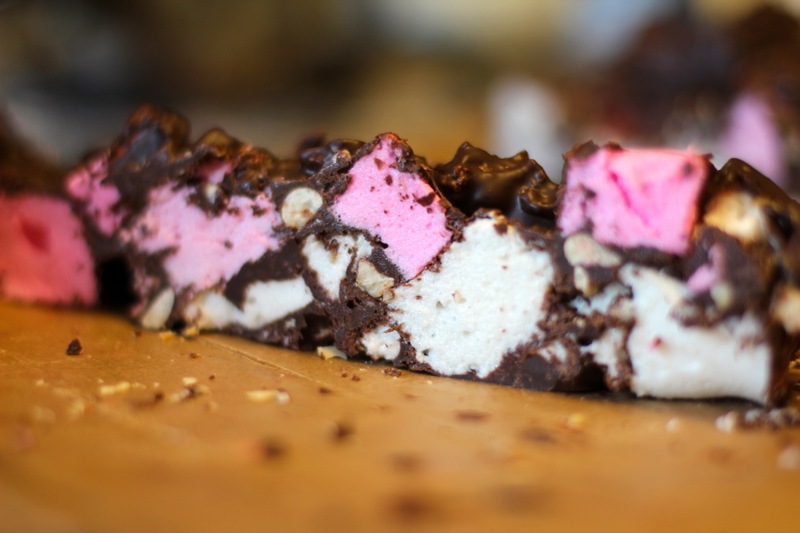 Once the chocolate has melted, set aside briefly, whilst you take the marshmallow squares and one by one add them to a large bowl.I like to add a few white, a few pink, sprinkle some peanuts, and alternate it, as I don’t want to stir it too vigorously to mix once the chocolate is added as I don’t want to break the marshmallows up. Add a few spoonfuls of chocolate as you continue to add the marshmallows until all the ingredients are in the bowl, then using a large spoon, gently mix until all ingredients are combined and the marshmallows are all covered in chocolate. 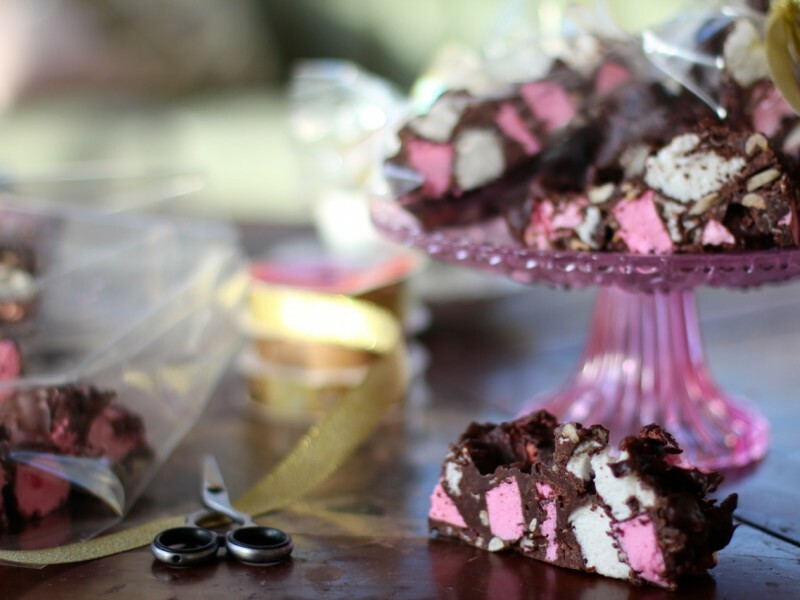 Using the same tray , reline it with parchment paper, then spoon your rocky road gently into the tin and spread it out, leaving no gaps and set aside to solidify in the fridge. Once completely set, take out of the fridge and take the lined block out of the tray.Using a large sharp knife gently cut into long bars or squares etc, depending on what you want to do with it. I really like Banana flavoured Marshmallow, but you can get creative and do a tutti frutti mix or whatever your heart desires!! !You will find a candy thermometer useful to make these, as the temp accuracy is important (and alot of other recipes I have ). You can get a cheap candy thermometer here in the UK/ Europe: Kitchen Craft Cooking Thermometer (£2.20) and here in the USA ($5.99): Farberware Protek Candy and Deep Fry Glass Thermometer, Clear ***Don’t know where to buy Agar Agar powder cheaply? Add 3/4 cup Aquafaba (butterbean or chickpea liquid from can) plus 1/2 tsp Xanthum gum to a stand mixer bowl and begin beating. (you can use electric hand mixers too!) From experience, I know that although it forms stiff peaks quickly, the volume increases and becomes fluffier If you start beating it at the same time you start the sugar syrup, so get it going before you do anything else! Now , lets start the sugar syrup: Add 1 1/2 cups of sugar and 2 1/2 tsp of Agar powder to a saucepan and stir to combine thoroughly. .Add 1/2 cup of water and 1/3 cup of glucose syrup and whisk together over heat to combine ingredients thoroughly. Continue stirring from time to time until the temp reaches 250f on a candy thermometre. You may find a candy thermometre useful to make these (and alot of other recipes I have ) , otherwise use the cold water test described in the instructions below. You can get a cheap candy thermometer here in the UK/ Europe: Kitchen Craft Cooking Thermometer (£2.20) and here in the USA ($5.99) : Farberware Protek Candy and Deep Fry Glass Thermometer, Clear<img style="border: none !important; margin: 0px !important;"
Once the chocolate has melted, set aside briefly, whilst you take the marshmallow squares and one by one add them to a large bowl.i like to add a few white, a few pink, sprinkle some peanuts, and alternate it, as i don't want to stir it too vigorously to mix once the chocolate is added as I don't want to break the marshmallows up. I really like Banana flavoured Marshmallow, but you can get creative and do a tutti frutti mix or whatever your heart desires!!! Oh my gosh! It is! I ate all the trimmings as I was bagging them! just a question - marshmallows doesnt need agar powder? YES!!! It does!!! Thank you for pointing that out! I added the ingredients into the description, because for some reason, even though the ingredients were entered in the back end of the site, its not displaying them :/ I must have accidentally missed that out when cutting and pasting the recipe into the description, so thanks for letting me know! I have amended that now! 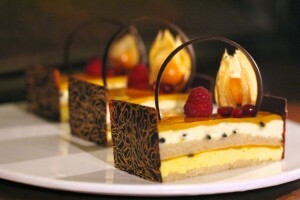 Looks really good, can't wait to make it. So glad you use weights for ingredients, it can really change how things turn out. Why don't more chefs do it ?